It was a leisurely gorgeous Sun Valley Sunday with two dog walks with Hugo, my toy poodle, and a glorious bike ride North on Hwy.75, so I had planned a really nice dinner for myself—shrimp and linguine with an olive oil/butter/garlic/fresh parsley sauce; however, my tooth, yes that one, the sweet one, was craving a desert. I had just bought some nice green Granny Smith apples and so had that in mind. Actually, what I had in mind was a memory of my mother’s every Sunday fabulous apple pie that she made. 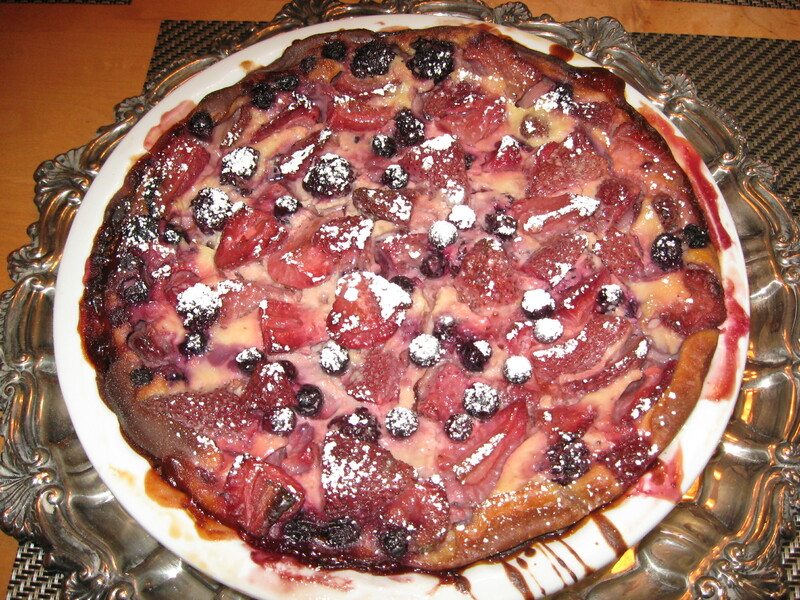 So, I thought something less complicated like a clafouti would be very good. And it was!!! Well, I didn’t eat the whole thing————but I could have. Pam-spray a shallow 2-quart baking dish. Pare and slice apples in thin slices. I leave the skin out—but that’s up to you. 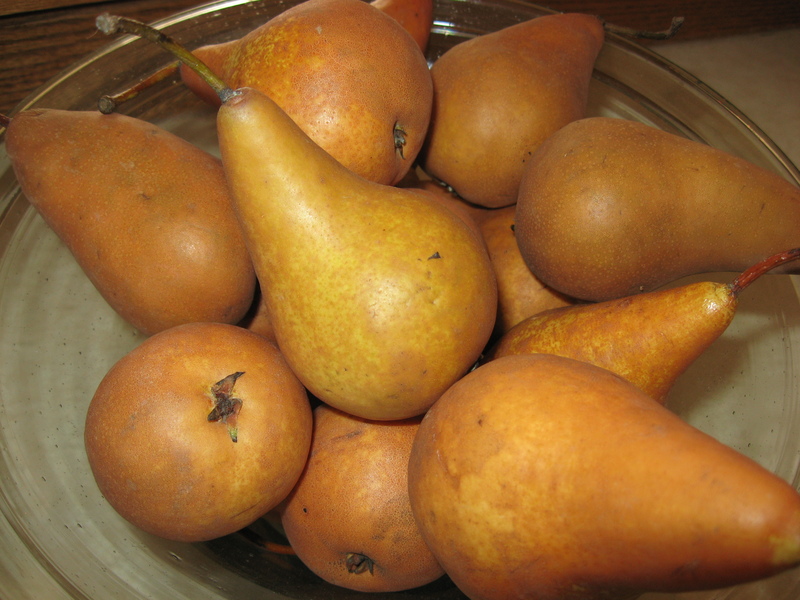 Drop the apples in a medium sized bowl and pour over them the Marsala and the grated lemon rind. Mix and let stand 10 to 15 minutes or longer if you wish. In a blender, combine eggs, milk, sugar, flouw, melted butter, vanilla, almond extract, and salt; whirl until smooth. With a slotted spoon, transfer the apples to the baking dish. Pour remaining wine into egg mixture and whirl again to blend. Lightly mix into the fruit the almonds and currants/raisins. Pour egg mixture over fruit. Bake in the preheated oven on the middle or top third rack until puffed and set to the touch in the center—55 to 65 minutes. It’ll settle slightly as it is cooling. Sprinkle powdered sugar over the top before serving. I also serve European Style yogurt (Straus) with it. But ice cream or crème fraiche will do as well. Just what I love—getting an emergency email from a friend who needs a recipe-quick- please!!! 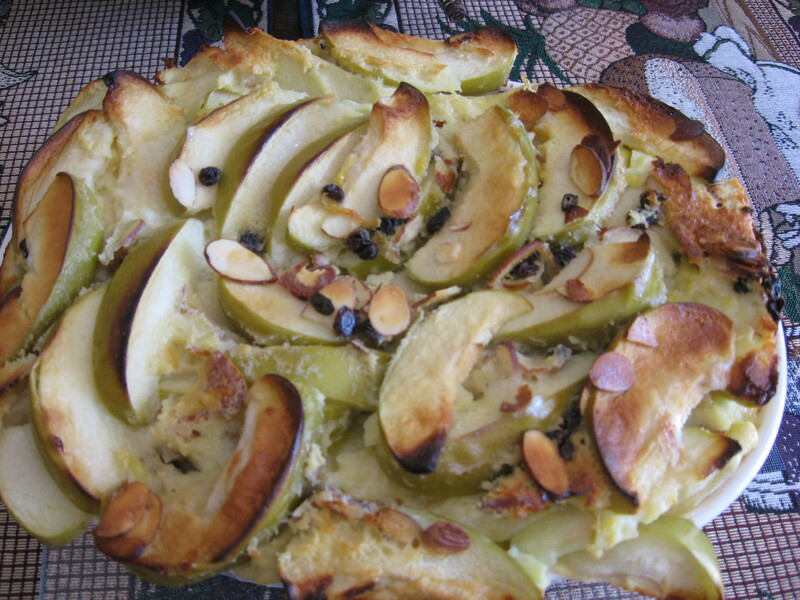 >> French peasant dish using the left over fruit from their orchards. >> whirl again to blend. Pour egg mixture over fruit. >> set to the touch in the center–55 to 65 minutes. >> sugar over the top before serving. >> the wine. And you can add some slivered almonds on top at the end.